For use with needles 9 Magnum, Round Magnum, Flat Shader. Right Stuff suggests getting 9 flat disposable tattoo tips for your shading works. Each tip comes packed in a sterile blister package and can be used only once. The quality plastic material used for creating these 9 flat tips, makes the products highly durable to stand the heat while working. 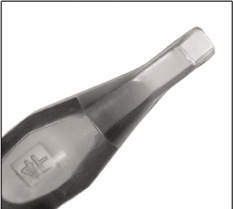 Additionally, the clear plastic allows seeing the ink and needles inside the tip. This way, you will feel a greater control over the machine. The flat tip can be used with flat shader, round magnum or 9 magnum needles.